Recent workers’ struggles in India prompt us to examine the concept of autonomy more closely. Movements in the Gurgaon-Manesar region have consciously or unconsciously addressed the reality of the social factory and have combined mobilizations from below and mass initiative with the need to formulate an appropriate strategy and effective set of tactics. Interesting response to this piece can be found here: On "Autonomy in India". Often automobile parts have many tiers to pass through before they end up at the Maruti or Hero Honda main factory. For example, rubber hoses for carburetors arrive in the form of rubber blocks in Mujesar, a village in Faridabad surrounded by industry. What remains of the village is the scattered layout of the small one-story shanty huts with cows and goats in front. The rest is transformed by the industry. Inside the huts people work on 1970s lathes of German origin, turning metal or working on antique power presses. Maruti’s supply-chain starts here.1 Gurgaon-Manesar has transformed the entire area into a social factory – not metaphorically but in reality, thus turning the battle at Maruti as one for the command and occupation of the social factory. The Maruti struggle showed the significance of the idea of the factory and beyond. The history of Maruti is a fascinating on two counts. It began operation as a state-owned automobile company (Maruti Udyog Limited) with its model Maruti 800 in 1983. In the final decade of the welfare state it was the car every member of the middle class aspired to own. It acquired a brand loyalty unmatched in the automobile sector. In other words, it was one of the success stories of state-owned enterprises in the midst of the growing perception that such state-owned enterprises were inefficient and only incurred losses. With the economic liberalization of 1991, Maruti saw a gradual transformation from a public sector undertaking to a joint sector company and finally to a privately-owned company. With Suzuki Motor Company of Japan now at the helm, Maruti not only saw a transfer of ownership, but perhaps the first experiment with just-in-time production, or what was called then the Toyota system of production.2 Under this new system, a whole set of stringent regulations governed the workplace. Workers were told how often they could take bathroom breaks, and how for long. Regulations determined how often a worker at the belt would need to drink water, or how long workers would be permitted to talk to one another on the assembly line. In short, this regime of production demanded the creation of a new kind of pliable workforce. It’s impossible to understand the subsequent struggles at Maruti – which now has two manufacturing units, one at Gurgaon and another at Manesar – without taking into account this attempt to forcibly transform the composition of the working classes. Indeed, the first wave of struggle at Maruti exploded between 2000 and 2001, during a period of transition, so to speak, as older workers were trying to come to grips with the new production system, which unleashed an unprecedented rise in productivity at the factory. This first struggle was important in the history of the struggle because in many ways it set the template for subsequent demands, as well as the question of strategy and tactics. The struggle began over incentive wages, which management unilaterally changed from the basis of savings of labor-cost to the basis of productivity per direct worker. The agitation began on September 8, 2000 with workers wearing black badges, shouting slogans, and meeting at the gates. After a general body meeting, the union decided on collective action, which included a tool-down strike, assembly, and collective hunger strike, as well as writing to the management to call for a union-management meeting. The particular labor process and the production regime put in place in this period were marked by the intensification of social control of the workers. Apart from the usual management steps, such as banning unions, suspending workers at will, handing over rebellious workers to the police, and restricting the physical movements of workers in the plant, social control was buttressed from the outside. The rural rich gentry, the upper caste kulaks, and the wise elders of the nearby settlements all supported the company bosses. Not only did these social forces profit massively from the increasing financialization and consequent sale of land for the special economic zone, the money was then invested in building up ties with the businesses. Thus, some invested the money to build resorts for the super rich coming from outside, while some built hutments for the workers of the area – all as matter of business. Some invested in high-end restaurant business or in the sale of luxury items. Some became contractors to build roads, while others engaged in supplying building material. Still others simply became agents in the sale of land and other property. This moneyed class is the mainstay of the mahapanchayat (village governing body) of the Gurgaon-Manesar area. In most cases the mahapanchayat supported the Maruti owners throughout these years. Not surprisingly, years later, when the great Maruti unrest broke out and the fleeing workers wanted shelter in nearby villages, some of the wandering workers were handed over to the police by the local gentry, particularly if the worker belonged to a low caste. What followed the agitation should be taken as a study in transition the of regimes from a welfare state to a “regulatory state.”4 Firstly, against the Maruti Union Employee Union (MUEU) which had led the agitation so far, a new management controlled Maruti Udyog Kamgar Union (MUKU) was founded, holding election in 2001. A massive retrenchment process in the name of Voluntary Retirement Scheme was undertaken and workers were laid off. In 2002, Suzuki increased its share to 54.2%. In 2006, the Manesar unit of Maruti was established. The grip of management on the workers was tightened as never before. There were regular reports of daily abuse of workers, mostly on ground of caste and the impossible working conditions of the lean production system. In 2011, a new wave of struggle at Maruti brought it to the forefront of working class struggle in India and attracted global attention. The discontent with working conditions and the abusive attitude of the management reached a breaking point. On June 3, 2011, workers at the Manesar plant submitted an application to register their independent union Maruti Suzuki Employees Union (MSEU).5 The next day a workers’ sit-in at the Manesar factory began. The primary demands of the workers were the right to unionize and to make all contractual and temporary workers permanent. On June 6, eleven workers were fired. On June 17, the labor department intervened and the workers were reinstated and a verbal assurance was given that their union would be registered. During this entire period the workers occupied the factory. They had learnt their lesson from the earlier struggle:it was unwise to leave the factory as this allowed the management to declare a lockout. What followed was constant threat and abuse by the management as well as dismissals and suspensions. This continued until August 28-29, when suddenly a large contingent of police entered the plant and management sealed the gate. When the workers arrived, the management declared that they could enter only after signing an undertaking (a signed promise) of good conduct. The workers refused to do so. Harassment and arrest of union leaders followed. On September 30, the workers agreed to sign the good conduct undertaking. However, only permanent workers were allowed to enter while 1,100 contract workers were denied entry. They were told to take their dues and leave. From October 7, permanent and contract workers occupied the factory, and on October 13, the High Court passed the order that the workers should vacate the factory. On April 18, 2012 the union presented a charter of demands to reduce work pressure, modify the extremely demanding work schedule, end of the incentive scheme, etc. In May, two union leaders were suspended because of an altercation with supervisor, but they were reinstated due to collective pressure from the workers. Matters came to a head in June-July when talks between management and the union broke down. Workers stopped reporting early and worked for only eight and half hours. On July 18, 2012 a supervisor abused a worker with casteist remarks and the worker was suspended.6 Subsequent events remain unclear. Workers said that bouncers were called by the management and violence broke out, resulting in the death of an HR manager. Who killed the manager remains a mystery. Workers demanded an impartial probe into the incident. In any case, the violence and the death of the manager allowed the state to crackdown on workers with ferocity. Thus came to an end of the year long struggle of the Maruti workers. Technological adjustments and the implementation of a flexible work regime have also had tangible effects on the factory floor. For instance , if Maruti workers previously received two 15-minute tea breaks per shift, now they receive two tea breaks of 7.5 minutes each. Likewise, the time allotted for lunch was reduced from one hour to 30 minutes. Strangely, while political economy speaks of intensification of production, and thus the increase of production through constant improvement of technology, it does not have the language to discuss, or any means of measuring, the role of the body and the intensification of its laboring capacities in the “Post-Fordist” regime of accumulation. This is the necessary background, however, for understanding the currents forms of labor (permanent, casual, and apprentice) and relations of production at the Maruti plant. The struggle also made the government labor department, which was till now mostly inactive, suddenly active and relevant. Once the settlement was reached, the onus of the implementation fell on the labor department.7 The officials of the labor department were genuinely surprised to find the kind of power they still had over these informal units. All these may change however after new labor reforms are put in place. But for the time being the struggle have forced them to take up investigations of the factory and the working conditions prevailing in these factories. As Stephen Sherlock’s 2001 study (The Indian Railway Strike of 1974: A Study of Power and Organised Labour) and Ranabir Samaddar’s recent study (The Crisis of 1974: Railway Strike and the Rank and File) show, the great Railway Strike in India in 1974 was one of the clearest instances of a current of “autonomy” developing within a movement. But the formation of the great autonomous institution of the NCCRS (National Coordination Committee of Railwaymen’s Struggle) was a political decision and an agreed decision of the political parties leading the struggle. NCCRS was backed by the tremendous upsurge of the railway workers. Mass initiative was created through struggle: its advances and successes, but also errors and failures. It is also important to note that the craft unions were crucial in the wave of sectional protests and strikes by railway workers across the country in 1967, 1968, 1970, and 1973, leading up to the great Railway Strike. In all these senses, therefore, one can say that the 1974 strike was based in a significant sense on the rank and file, particularly the newly emergent crafts unions among the rail workers. While labor historians generally regard craft unions as being limited in their expressions of class consciousness, and prone to the pulls of sectarian rather than wider class loyalties, such crafts unions broke the stranglehold that the large federations had on workers’ initiatives. Therefore, in the papers relating to the Strike of 1974, we find repeated references to the loco-running staff (locomotive drivers, train guards, etc.) Whoever has studied, for instance, the legendary railroad workers’ movement in the United States will know the strategic importance of the loco-running staff because of their work conditions, long working hours, high-pressure work for days without a break, and the solidarity that the loco-men forge through their work.8 The ascendancy of the Loco Running Staff Association (LRSA) was crucial in mobilizing the workers for the strike. In some sense, with the firemen joining the rank and file, the railwaymen were now ready for action because they had found their leaders. Other nodal points in this submerged history of autonomous workers’ movements in India bear mentioning. First, there is the well-known movement for factory self-management in the Kanoria Jute Mill in West Bengal in the 1990s. This movement was mobilized after an autonomous group of workers – with a very particular political perspective – led a factory occupation with the support and solidarity of different Left organizations.10 There was also the Dalli-Rajhara miners’ movement in the late 1970s, led by late Shankar Guha Neogy, a case once again marked by strong organization, a keen sense of tactics and strategy, and active involvement of the rank and file. This history of autonomous organizing on the part of workers exhibits the dialectical dynamics we described above. 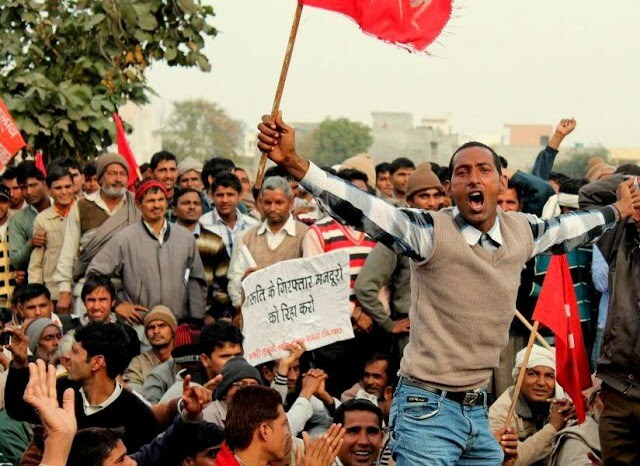 Strongly poised between the two poles of insurgent self-activity and established political and social institutions, workers in India are now learning to strategically and tactically use the concept of autonomy. On the other hand, the Indian state has no illusions about the autonomous character of these recent workers’ movements, and the threat they pose. As Maruti showed, the state came down violently on the strike and the entire movement, justice was summarily denied, criminal justice provisions were abused, trade union rights were trampled upon, and every governmental step was taken to ensure that Maruti does not become the symbol of a politics of the workplace and beyond.13 The employers, public authorities, local elites, the moneyed gentry, and the machinery of law and justice – all of these agents allied against the workers. In this instance, the imperative for the workers’ struggle was not to be autonomous, but be more and more connected to the existing political relations within society, the reality of the social factory, which called for rigorous thinking and debate about strategy and tactics. Originally posted on the Viewpoint Magazine website. 1. Gurgaon Workers News, Newsletter 3, May 2007. 2. Peoples Union for Democratic Rights, Hard Drive: Working Conditions and Workers Struggles at Maruti (Delhi: Hindustan Printers, 2001). 4. This is how the new role of the state is articulated in a paper published by the Planning Commission in 2008. See Approach to Regulation of Infrastructure. New Delhi: Secretariat for the Committee on Infrastructure, Planning Commission , Government of India, September 2008. 5. Peoples Union for Democratic Rights, Driving Force: Labour Struggles and Violation of Rights in Maruti Suzuki India Limited (Delhi: Progressive Printers, May 2013). 7. For details of the settlement see Peoples Union for Democratic Rights, “Wazirpur Struggle Continues, As Factory Owners Refuse to Honour Written Agreement,” (accessed September 15, 2014). 8. Rank and File: Personal Histories by Working Class Organizers, ed. Alice Lynd and Staughton Lynd (Chicago, Illinois: Haymarket Books, 1973); see in particular, Wayne Kennedy, “An Absolute Majority,” 233-52. 9. For a detailed discussion on the role of the rank and file, particularly the Locomen in the General Strike of 1974, see Ranabir Samaddar, “Forty Years After: The Great Indian Railway Strike of 1974,” Economic and Political Weekly volume 50, no. 4, January 24, 2015; Ranabir Samaddar, “The Indian Railway Workers and the Crisis of 1974,” Working USA: The Journal of Labor and Society, December 18, 2015. 10. Kushal Debnath, “West Bengal: The Neo-Liberal Offensive in Industry and the Workers’ Resistance,” Revolutionary Democracy (accessed on October 16, 2014). 11. On the paradoxical play of autonomy, mass initiative, and political leadership of the movement in the organization of the 1974 Indian Railway Strike, cf. Stephen Sherlock, The Indian Railway Strike of 1974: A Study of Power and Organized Labour (New Delhi: Rupa & Co., 2001). 12. From respective Annual Economic Surveys, cited in a report, “Maruti Karkakhanar Sramik Andolaner Shikkhoniyo Kichu Dik,” Charcha, August 2013, 54-8. 13. On the legal dimensions of the violations of Maruti workers’ rights, see “Merchants of Menace: Repressing Workers in India’s New Industrial Belt: Violations of Workers’ and Trade Union Rights at Maruti Suzuki India Ltd,” Report of the International Commission for Labour Rights, New York, n.d.
14. Karl Marx, Capital, Vol. 1, trans. Ben Fowkes (London: Penguin Books, 1990), 682.